ACT Light Rail have provided a submission to the ACT Government on the Gungahlin to Civic Transit Corridor Study. It is available in PDF form from here. This article provides the recommendations from that submission. The recent Civic to Gungahlin transit corridor study has been released and once again the focus has been placed on the cost of light rail compared to bus rapid transit. It is not a valid comparison. Additionally a fantasy of turning Northbourne Avenue into a promenade has been used to inflate construction costs. to begin detailed engineering reports for a two track light rail line running from Civic to Gungahlin, with limited stops along Northbourne Avenue. 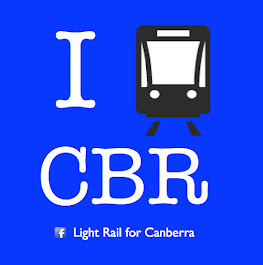 ACT Light Rail do not argue that light rail is suitable for every cities public transport requirements, but in the years that we have been lobbying for it in Canberra, it has become more and more suitable for our city. Our consistent stance is that light rail can provide the backbone of Canberra’s mass transit with ACTION buses providing increased local services. It is important that this model be implemented as road congestion is increasing, the bus network is barely coping and parking is decreasing. Road construction continues without public debate, while proper investment in sustainable public transport infrastructure is opposed by politicians and treasury. Any investment in modifications to Northbourne Avenue for Bus Rapid Transit would be a waste of public money and should be abandoned. The best option would be to begin planning for light rail and increase the frequency of buses on the Northbourne - Gungahlin route until light rail was running. The kerbside option should be abandoned. The light rail option would consist of two lines running from Gungahlin to Civic, with stops at Gungahlin, Mitchell, Epic, Dickson, Macarthur Avenue and Civic. The light rail line is suitable for access by ACTION buses. Traffic signal priority is designed into light rail vehicles. The stops at Gungahlin, Mitchell and Epic should be ‘Park and Ride’ stations. The stations themselves could be quite simply constructed, to protect commuters from the weather and provide adjacent access to ACTION buses. If more elaborate facilities were decided upon, the private sector may even consider constructing these park and ride stations. A light rail depot is built in Mitchell. These realistic recommendations remove much of the ridiculous overblown fantasy costs of complete reconstruction of Northbourne Avenue, from an 8 to 10 lane road with light rail running along each side, back to the vision that many Canberrans have. A vision first created by Walter Burley Griffin when he designed that wide median strip with rails along Northbourne Avenue on his first rough sketches of our nations capital. The Ministers own consultants agree with him, as they say in the concept plan ‘LRT is the best overall outcome for Canberra”.